We’ve had a hectic week here. Mostly it’s been my son being needy after getting second degree burns on his fingertips. He’s ok, they’re considered minor burns because it’s only his fingertips and they’re pretty small, but he refuses to keep them dressed which causes him more pain. He’s like a tiny Houdini. Of course, this is the kid who can take off his diaper with overalls or a onesie on. I wanted to get a metric crapton of them finished (or at least 9). They work up pretty quickly, but I sustained a crochet-related injury last night (I’m fine now) so I might get some more done today. But I have two for now. Remember folks, I crochet really tightly. So if you’re looking at these going, “They’re too big! THEY’RE GOING TO TAKE OVER THE WORLD!! !” you can ch 6 instead of 8 in round 1 and make fewer rows. Basically you want a tube. Pinch one end shut flat and sew closed. Weave yarn in and out of the stitches between row 3 and 4 and pull to cinch closed. I also wrapped the yarn around the weaved in stitches once and pulled really tight to make it cinch smaller. Stuff firmly, up to between rows 3 and 4 of other end. Pinch other end flat and sew closed, then cinch that end closed between rows 3 and 4 from that end. Weave in all loose ends. Coffee mug done!! I made one with hot chocolate too. And even though I don’t like marshmallows (neither does my daughter, actually) I put marshmallows in the hot chocolate! Depending on how everything is lining up, you may only need to make the first 5 rnds of the beverage. 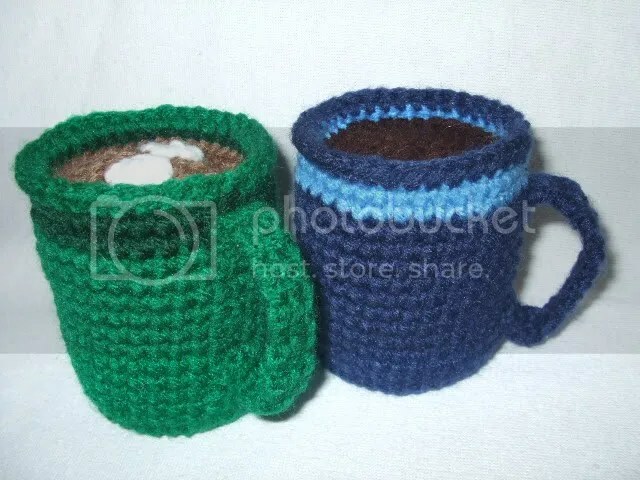 I did 6 rnds for the hot chocolate in the green mug and 5 rnds for the coffee in the blue mug. Sew base to bottom of mug. Stuff and sew beverage inside mug, between rows 18 and 19. Sew handle on side of mug as shown on green mug. Last year, I made a banana. I wrote the pattern with sport weight yarn, which is a little inconvenient. I never tested it out with worsted weight, ’cause I got images of these huge bananas dancing around. So, I wrote a new pattern with worsted weight, to be the same scale as all my other fruit. 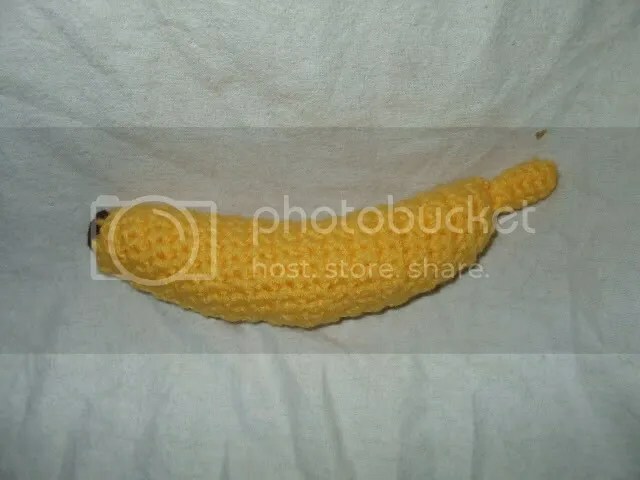 I’m replacing the pattern link on Ravelry with this one, but I will keep the old pattern around just in case you want a huge banana. Or have some yellow sport weight lying around. Line up both banana sides and whipstitch around edges, leaving either top or bottom for last. Stuff as you go. Sew stem to top of banana and sew bottom to bottom of banana. 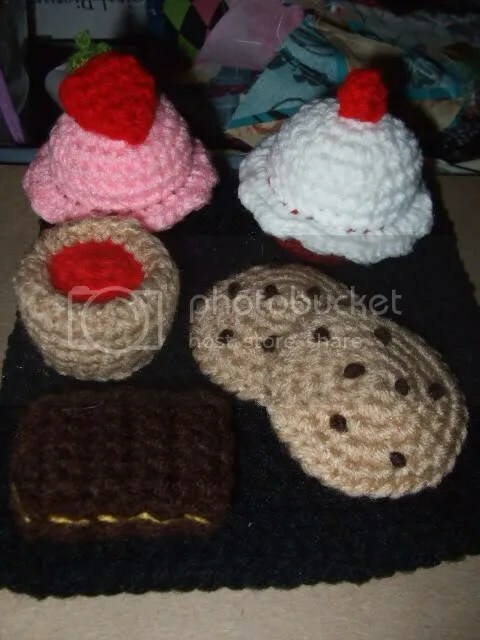 Remember way back when, when I mentioned something about a dessert-themed crochet project? 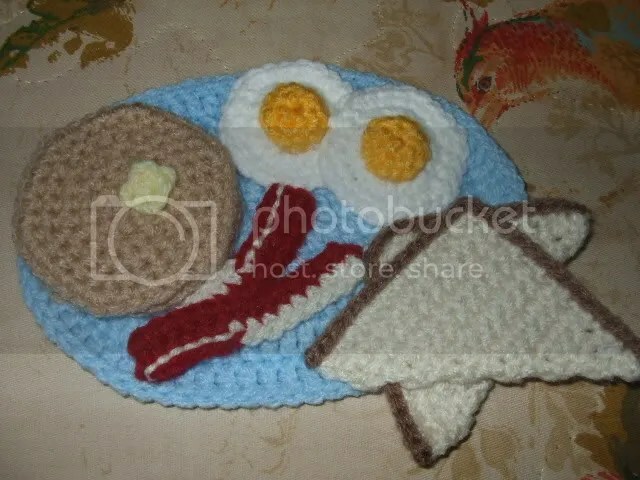 OMG I’M POSTING A CROCHET PATTERN!!! When I was a little girl, I was involved in Brownies, and then Girl Guides. UK/Canada’s version of Girl Scouts. Every year there would be at least one bake sale. I always loved bake sales. And so, here is a small sampling of what you would find at a bake sale!! Cupcakes, Nanaimo bar, chocolate chip cookies, and a jam tart. For those not familiar, Nanaimo bars… I don’t know how much of that is the truth. But. I know that they were named for Nanaimo (I actually lived in Nanaimo for a few years) and everyone loved them when I was growing up. Basically it’s a crumby/cookie base, with a custard-flavoured icing (also delicious in mint) and then a layer of hard chocolate on top. I made two cupcakes. 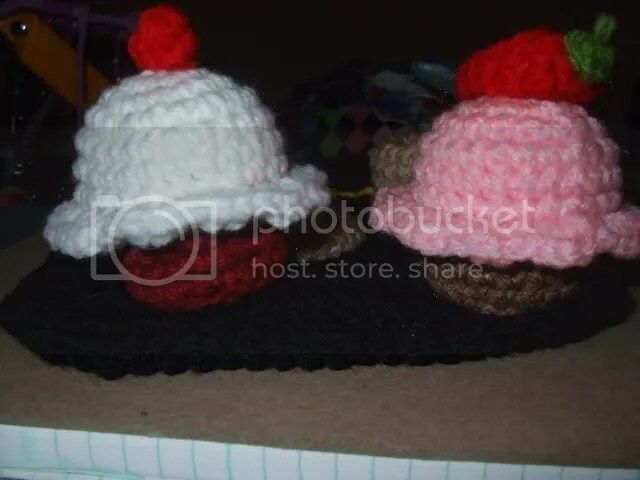 The one with the cherry on top is a red velvet cupcake, and the other one is just a regular cupcake with strawberry icing. The cupcakes and tart are all stuffed, just lightly enough to hold their shape. If I didn’t attach them to the tray, I would probably stuff the stuffing out of them. Or into them. 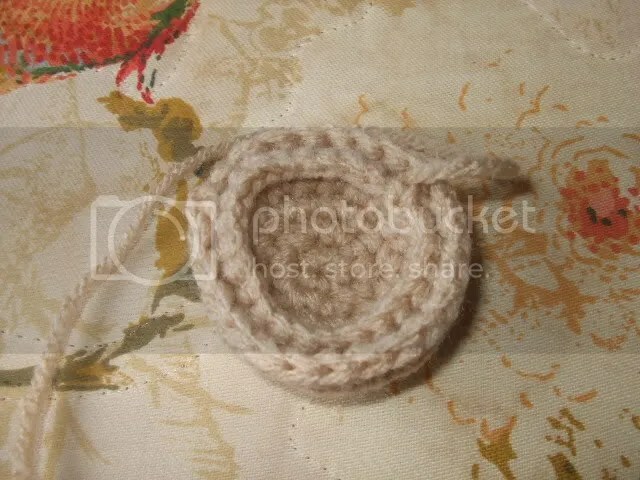 Also note that while you theoretically could crochet the tart base and sides as one piece, you would end up needing to stuff from the indented top and it would take a lot of fussing with to get it to look right. 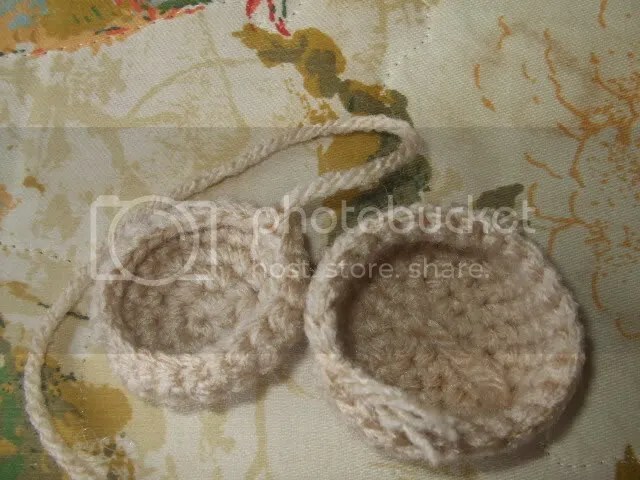 break yarn, finish off. 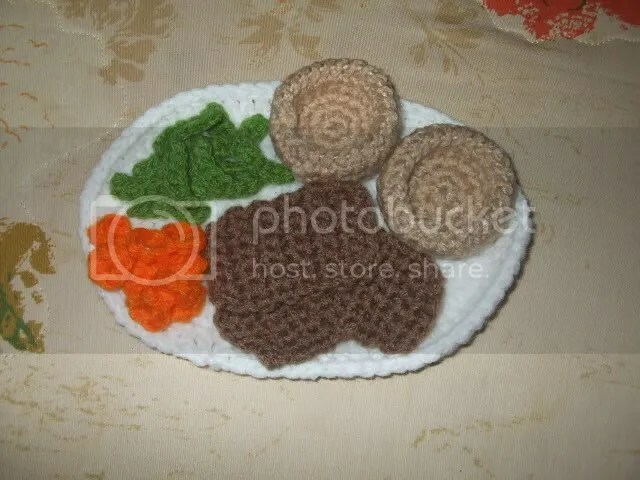 Make french knots with dark brown for chocolate chips. Whipstitch edges of cookie parts together, right sides out. Turn tart filling inside out (so jam is facing up). Nestle inside tart side and whipstitch top edges together with tan. Stuff, then sew on bottom. Layer bar pieces with two brown, the yellow, then the last brown. Do not whipstitch- sew through all four layers just inside the outside edge. Sew top edge of cupcake bottom between rows 7 and 8 of the cupcake icing. Attach strawberry stem to top of strawberry, push strawberry flat and attach to pink icing. Attach cherry to white icing. Arrange and glue on tray if desired. 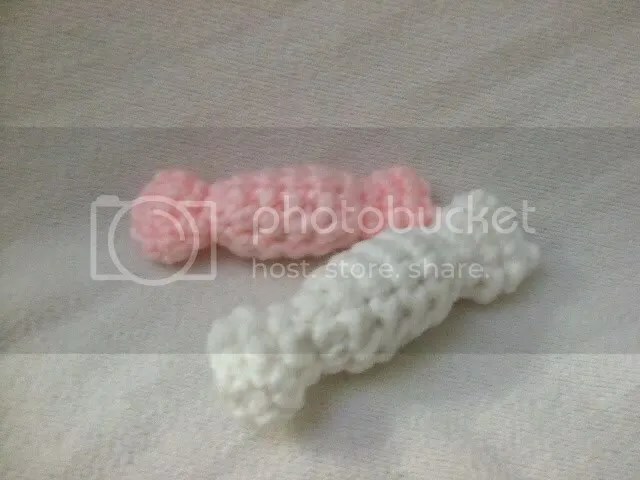 Yay new crochet pattern!! I am ant-free and much happier. 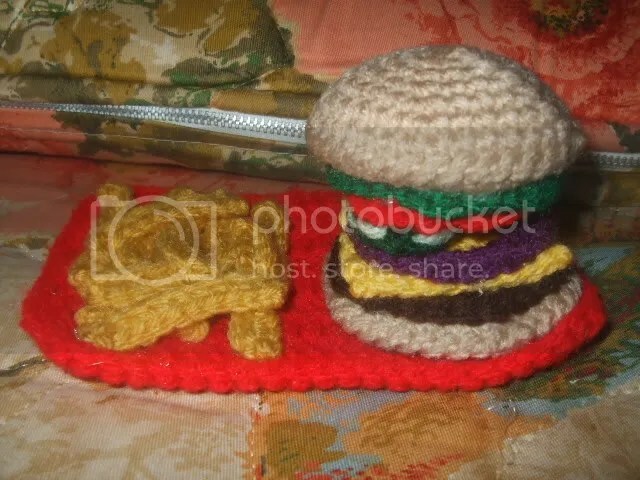 This project does require just a little bit of stuffing. I’m not entirely happy with how the pickles look, but another round of sc would have been too big, and leaving them without a “peel” looked wrong. It is quite an imposing hamburger, all stacked together. I left mine in two halves. glue gun, optional- I really do recommend the glue gun, it’s pretty precarious without gluing at least some of it. Whipstitch edges of two buns together for bottom. Whipstitch row 7 of bun top to remaining bun 3/4 of the way around, stuff lightly enough for it to hold a dome shape, but stay flat on the bottom, sew closed. Arrange and glue together if desired, glue on tray if desired. I made 11 fries and glued them on the tray as well. Two updates in one week! Not giving myself a deadline is helping the creative process. 😉 So, obviously, breakfast. I realize that most people don’t have baby blue plates, but I wanted something that the eggs and bacon wouldn’t get lost on, and blue was the first color I picked up. No syrup. I, personally, don’t put syrup on my pancakes. I prefer jam and peanut butter. 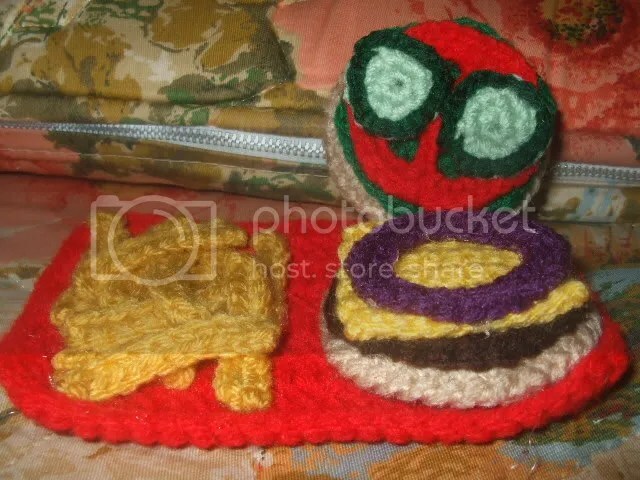 And I haven’t found a way to make a large pool of *sauce* (or other gooey, liquidy, or drippy condiment) look good with yarn. And it’s another stuffing-free project!! Note that I have the “wrong” side up on both the egg yolks and the pancakes- I like the way it looked and shaped better that way. Attach butter to one of the pancakes. Attach egg yolks to egg whites. Arrange and glue on plate if desired. 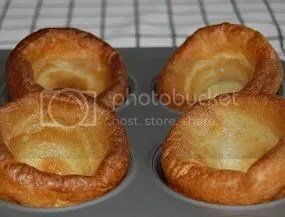 If you’re unfamiliar with Yorkshire Pudding, here’s what it looks like. I’ve heard that they can be compared to American pop-overs. Having never tried a pop-over, all I can say is that they were my favorite part of a roast beef dinner growing up. This is another stuffing-free pattern! Worsted weight medium brown, tan, orange, white, and sport-weight medium green. The beans look just fine with worsted weight. Have Yorkshire Pudding Outside with right side facing out and Yorkshire Pudding Inside with right side facing in, nestle Yorkshire Pudding Inside inside Yorkshire Pudding Outside and whipstitch the top rows together. Weave in all loose ends. Arrange all pieces and glue on plate, if desired. I made 9 carrots and 11 green beans, make as many as desired.